Aussies love a trip to their local hardware store – even if they end up spending more than they planned to. That’s one of the findings of Canstar Blue’s latest study of 2,500 hardware store shoppers, which has seen Bunnings rated highest for overall customer satisfaction. Three quarters (74%) of respondents to the survey said they enjoy an outing to their local store, but a very significant three out of five (60%) admitted they usually end up spending more than they bargained for. Just over half (53%) of the adults surveyed also said they turn to the experts at their hardware store for DIY advice. The older you are, the more likely you are to enjoy an outing to your local hardware store, we found. And interestingly, women are more likely than men to spend more than they planned to. Women are also more likely to ask for DIY advice. Not everyone is a DIY expert, so many consumers want great service and advice. For most people, a trip to their favourite hardware store is an enjoyable experience, but they still want to feel like they’re getting good value for money. 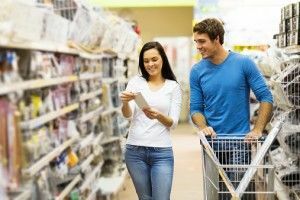 And with three out of five usually spending more than they were expecting to, it suggests many consumers end up leaving the store with extra items that caught their eye along the way – a strong indicator that there are bargains to be had. How to avoid overspending in store? Compare – do your homework before you head to the store and have a rough idea of how much that new lawn mower or garden fence should cost you. Plan ahead – write a list and stick to it. Always keep your list in mind, and before you head to the checkout, take one final look to make sure you haven’t picked up any unnecessary items. Set a budget – once you know roughly what you are likely to spend, set a budget and stick to it. Like your list, keep your budget in mind and give it one final thought before handing over your cash. Stay busy – the more time you spend in store, the more likely you are to spot another bargain, and before you know it your budget is well and truly blown. Get in, get out, and get home to mow the lawn or put up that fence. Of course what the above advice doesn’t take into account is that spending a couple of hours walking around your local hardware store is actually FUN… Maybe leave your wallet/purse in the car?